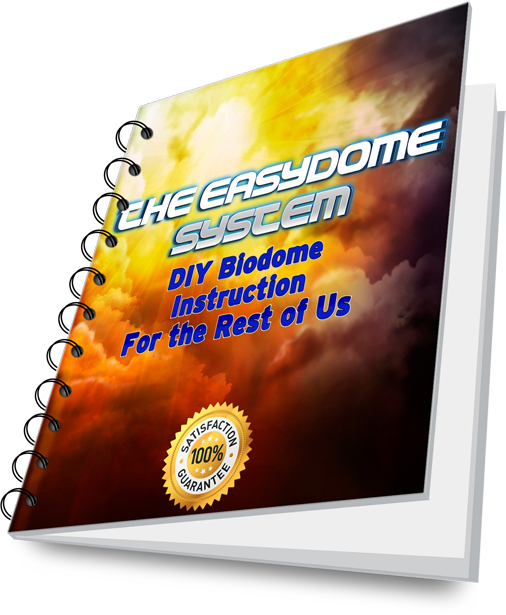 ← Do You Have to Build A Biodome Greenhouse to Grow All Year Long? OK, so I am exaggerating a bit, but these amazing biodome treehouses are so cool I had to do a quick post on the subject. 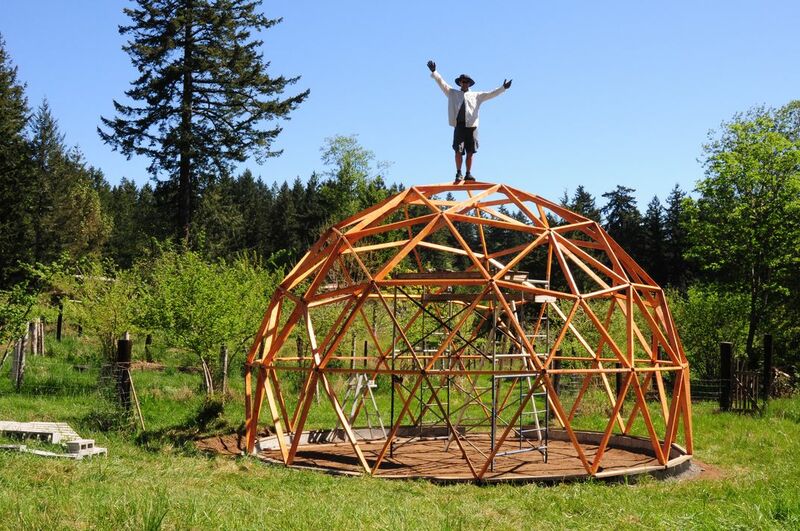 You could grow plants up in your geodesic treehouse but it would have to be aeroponic or aquaponic because dirt is heavy! 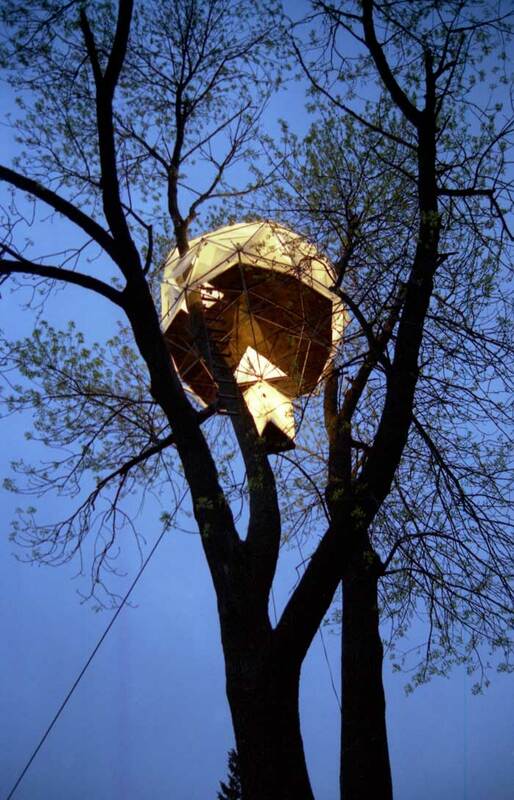 Leaf House By 02 Design was the first geodesic treehouse they produced. Weight was kept to a mere 1,200lbs by using aluminum struts and plastic flooring, panels and lift basket. Completed in September 2005 near Pewaukee, Wisconsin this amazing biodome treehouse is 13 foot diameter and uses an external aluminum frame, recycled plastic for the flooring, and high density polyethylene for the rain shedding biodome canopy. Which brings us to the concept of biodomes and sustainability on a more “grounded” level. Being in a position to grow even some of your own food is becoming more and more important. There is a growing number of people in the world and we are facing ever increasing food prices as well as natural and man made disasters that influence food supply. By having your own biodome greenhouse “food factory” in your back yard you can quickly start supplementing your diet with amazing home grown greens, veggies and fruit. 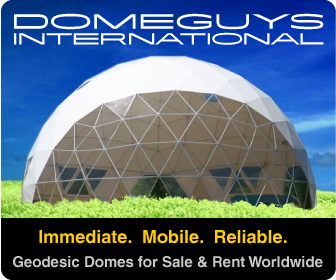 But if you are serious about sustainability, hate weeding, love tinkering and want to seriously “turbo charge” your biodome greenhouse then you need to check out this site. www.Aquaponics4You.com Note: Because it is a commercial page you need to “drill down” a bit to get to the sections that are interesting. 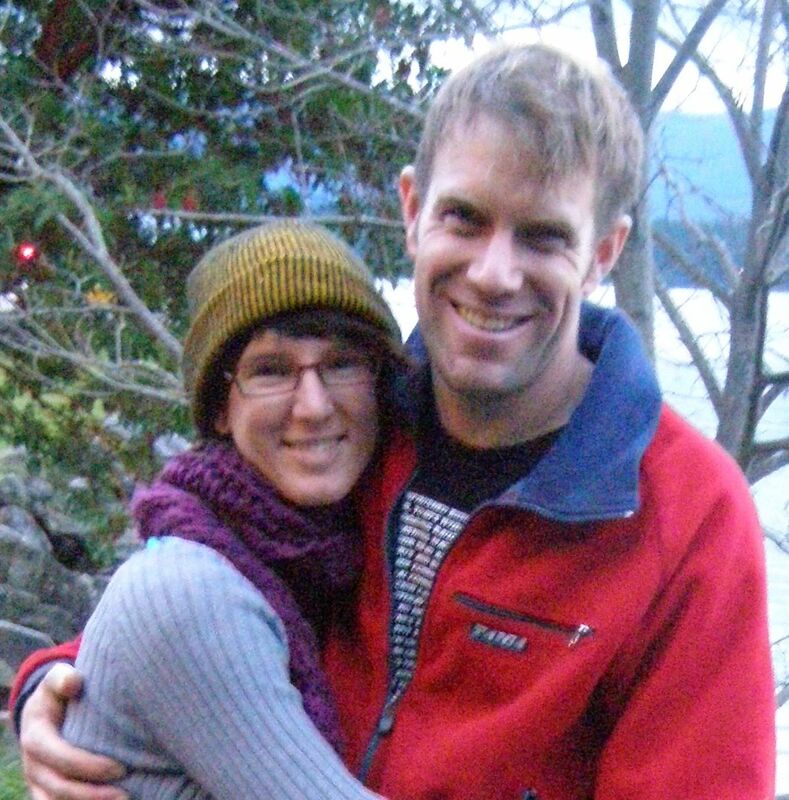 You could go on the forums and get similar information but in this case John (a certified organic aquaponic farmer) has taken all the guesswork out of it and if you follow his guaranteed, step-by-step instructions you will soon be harvesting dirt free, organic, produce from your own aquaculture powered geodesic greenhouse. Anyway don’t take my word for it. Check into it yourself and when you do you will find that one of the fastest ways to improve your yield in your biodome greenhouse is to include aquaponics in your design. Plus its nice and techie for those of us who secretly would like to be a scientist instead of a blogger! Good luck and post your results back here so the rest of us can benefit from your experience! P.S. If you haven’t watched the Food Collapse and Biodome Creation Presentation don’t delay! This is powerful, timely information and if you aren’t at least aware of the potential food crisis, you may be putting yourself and your family at risk. This entry was posted in Biodome Aquaculture. Bookmark the permalink.